The Indigenous People of Biafra (IPOB) on Saturday declared that it had no interest in the forthcoming Anambra governorship election. The group said they were aware of the efforts by some politicians trying to drag its name into Nigerian politics. IPOB in a statement by its spokesman, Emma Powerful, said they remained committed to the leadership of its founder, Mazi Nnamdi Kanu, whom he described as their prophet. According to him, IPOB was not interested in any political party and would in no way support any politician in Nigeria. “IPOB and its leadership worldwide warn those involving IPOB under the command and leadership structure of Mazi Nnamdi Kanu with the forthcoming electioneering politics of Anambra State under the constitution of Nigeria should desist from doing so forthwith. We have observed with alarming dismay how some shamelessly unscrupulous individuals are trying desperately hard to tag our revered name IPOB to their nonsensical party politics in Nigeria. The public is hereby warned to stay away from such groups and individuals because such adventure have always ended in shame. IPOB is not and can never be part of any electioneering in the Luggardian contraption we have come to know as Nigeria. Anybody telling you IPOB is supporting any political party is a deceiver and should be stone. IPOB under the leadership of the prophet of our time Mazi Nnamdi Kanu are not part of these treacherous anti-Biafra meetings going on in the homes of some washed out politicians and can never be part of it. We are not in the business of campaigning for the restructure of Nigeria, we are 100% focused on the puritanical pursuit of the restoration and liberation of Biafra from tyranny. We cannot be part of those who are claiming to be IPOB in whatever customary guise or assumed elders who have spent their whole lives serving Hausa Fulani interests. They have achieved nothing in their lifetime towards the liberation of our people worth referencing. They have continued to shamelessly tag IPOB to their myriad of names in the hope of misleading our people into following them into their evil Nigerian politics. The Elders Council established by our leader Mazi Nnamdi Kanu has been dissolved since 2014 when it was discovered these ‘elders’ were campaigning for the same Buhari and his APC to take over Biafraland. We stopped them then and we shall stop them now no matter the party they intend to use to achieve their satanic purpose disguised as patriotism for Biafra. These criminals dancing from one project of shame to another have been using the revered name of IPOB to dupe desperate politicians. 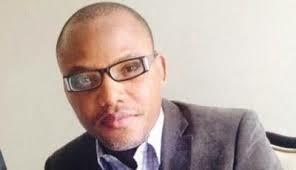 First these criminals said Biafra will come by legal method. When that failed, they said it would come through diplomatic means. Now that their much vaunted diplomatic approach has fallen flat, they have opted for what they call political process. This is their last ditch desperate attempt to immerse themselves in the sell-out politics of Nigeria. We IPOB say we are not part of it. Therefore, we would like to warn again that the name IPOB is hallowed and cannot be involved with Nigeria politics.